I am now a lover of Evernote*. It did however take me three attempts over about three years to come to love it though. I think I was overwhelmed by the potential of this app and didn’t really know where to start. I have been actively using it since late last year and it has made a huge difference to staying on top of things for both work and home and reducing significantly the amount of paper I bring into and keep in the house, which has been the main drawcard for me using the app this time around. As each month goes by I am finding more ways to use it, so this is very much a beginners’ guide for Evernote in the home. If you use it for home purposes and have other ways to use it I would love it if you shared in the comments below! And I am adding more ways to use it all the time. There are many posts out there on how to best set up Evernote. Some people have highly complex systems, but for me I keep it pretty simple. My advice is to set it up in a way that will work for you and you will find easy to use. The first thing I did was to create notebooks. Just like I would keep separate paper note books (or scraps of paper!) for different areas of my life, I set up online notebooks. I deliberately kept the notebooks broad for example “Children” as opposed to a notebook for each child. The reason being that Evernote lets you tag each note you make, so I can tag a note with a child’s name and then file it in the Children. I have a notebook titled “Wishlists” where I save all the books I want to read, cafes I want to visit etc, all tagged with more specific info like books, cafe, movie. When you are entering tags, Evernote uses predictive text so you can use the most appropriate tags available. Well structured notebooks and tags help you find what you are looking for easily, but the search functionality within Evernote is excellent, so if you happen to file it in the wrong notebook or forget to tag a note, you will most likely still be able to find it easily and quickly. 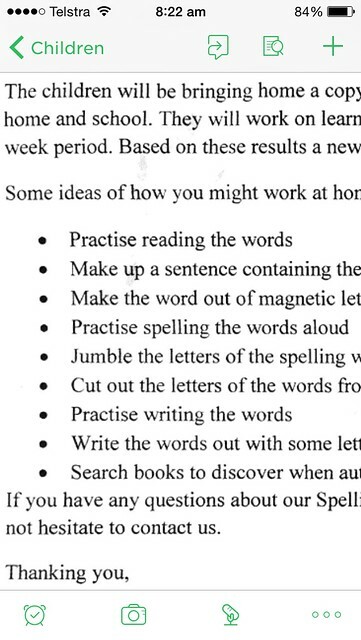 While there is much communication that comes via email from the schools, we still have many notices that come home in paper form with the kids. 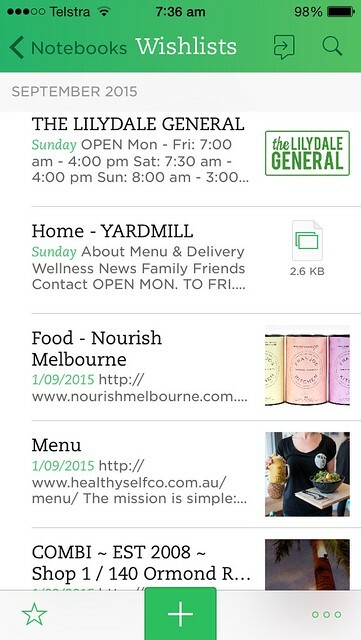 I have downloaded the Evernote Scannable app (currently only for IOS) to help me manage this paperwork. Scannable is amazing and I use it multiple times a week for various things. 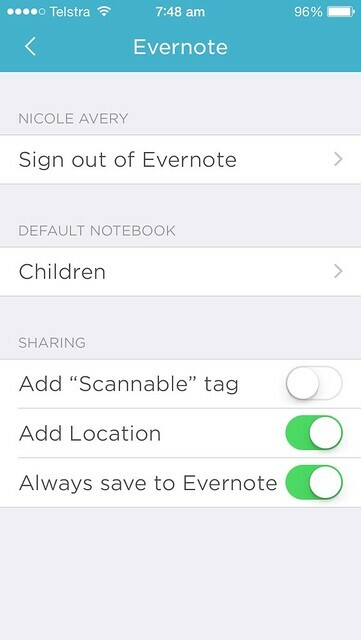 I also have Scannable set to automatically save my scans to Evernote and use Children as my default notebook. You can change the notebook when saving the scan. This was so helpful at the start of the school year when I was attending school parent information nights and receiving so many papers. I would scan them all, file them in the children notebook and tag them with each child. I could then access them anytime on my phone or any computer. 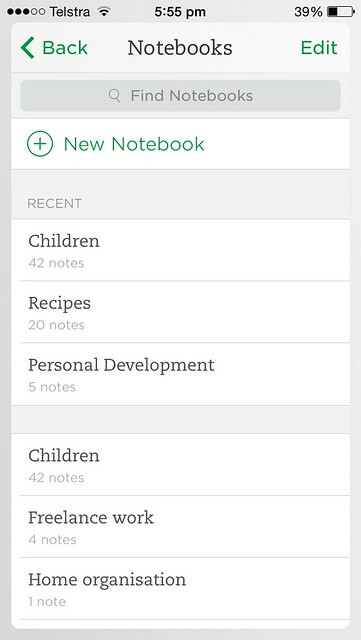 You can also share notes with others (like their dad!) if you need to and they don;t have to be on Evernote to share with. I use the Scannable app to scan any receipts or warranties I wish to keep. Mr I has a Dropbox folder where he likes to keep these types of documents, and Scannable lets you save straight to Dropbox. You can choose the appropriate Dropbox folder as well. The same goes for books, shows, music. I can take a snap of what I have seen, like this documentary that is going to be on TV. I can then set a reminder so I can remember to watch it. 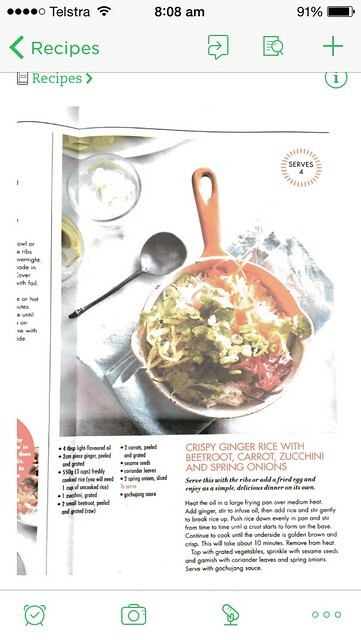 Often I will see recipes I like in magazines and newspapers. 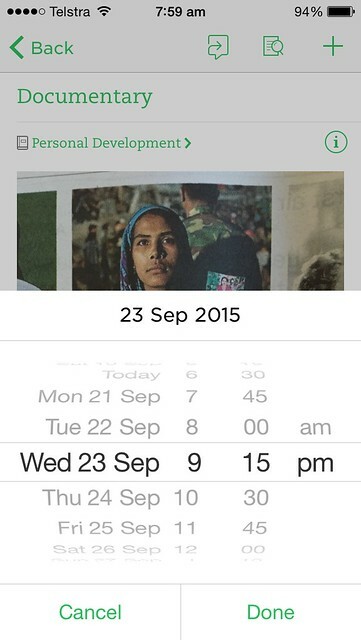 Evernote makes it easy to keep them without the paper. Using the Scannable app again, I scan it and upload it. I also can bookmark recipes I see online and want to try out. As I like to make up my own recipes, I will often photograph menus of meals that I have eaten and loved, so I can remember what was in it and file and tag appropriately. I also like to make my own versions of food that I buy, like the Larabars and Kimchi. To do this previously I would keep wrappers etc. Now I can take a photo or scan of the list of ingredients and file away until I have a go at making it myself. Ever seen a recipe on Instagram and thought I want to make it? 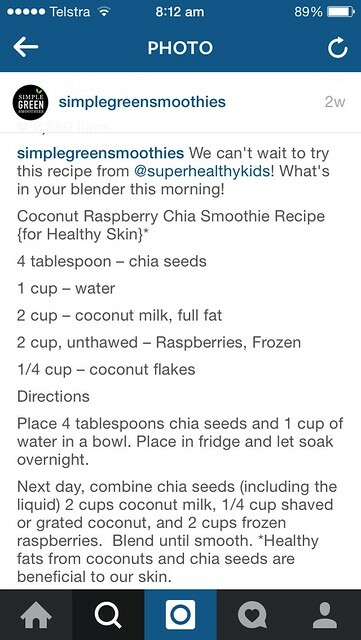 I now just take a screenshot of the recipe, then share that photo in my recipe notebook in Evernote to make later. I scan the invitations as they come in and file them away. The brilliant search function that comes with premium actually searches within the documents/photos. The photo above shows the result for a search I did on “birthday”. 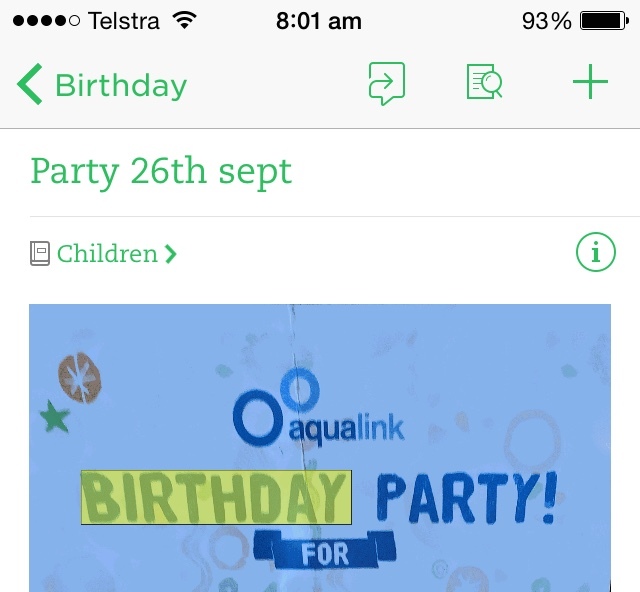 Nowhere in the note I created for this invitation did I write the word birthday, but you can see Evernote found birthday written on the invitation and has highlighted it. Every time I have some form of paper in my hand which I think I want to keep, I am trying to use Evernote instead. It is very much about me retraining myself now I have finally started. If you use Evernote for the home I would love to hear how! * This link is a referral link, which means if you sign up to Evernote using this link, I will earn referral points. It doesn’t impact your sign up at all 🙂 .